Indecisiveness is something which all of us encounter at some point of time. The inability to arrive at a decision or the mental haziness which deprive us of bringing in the much required clarity of thought is a common ill which affects all of us. The faltering mind is the antithesis of a stable personality. Our mind should be premised on the strong value systems and the philosophies that we uphold in our lives. Then only we can coax and cajole our mind to arrive at a decision. But this is something easier said than done. The human intellect is very intriguing. It has the ability to rationalize between the pros and cons and often gets stuck in between. This phenomenon is beautifully illustrated by the paradox “Buridan’s Donkey”, named after the 14th century French Philosopher Jean Buridan. It refers to a hypothetical situation where in a donkey is placed precisely midway between a stack of hay and a pail of water. 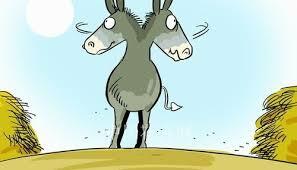 Since the paradox assumes that the donkey will always go to whichever is closer, it will die of both hunger and thirst since it cannot make any rational decision to choose one over the other. This illustration threw open a new philosophy in the conception of free will. Buridan advocates that each human being is endowed with a “free will” and a moral determinism so that whenever they are faced with such testing situations, where there is perfect equilibrium between opposing reasons, they should choose the greater good based on free will rather than on rationalization. Free will is also called as intuition. Sometimes we know what we are doing is right, though we cannot attune any reason to it. That is called intuition and we, at times, need to be intuitive to reach a conclusion and find a solution. Decisions are at the heart of success, and at times there are critical moments when they can be difficult, perplexing, and nerve racking. The Latin word “Decido” has two meanings. It can mean to decide and also to fall off. Hence plants are called deciduous if their leaves fall off during winter. Making a wrong decision provokes the fear of falling. Each and every business day we need to make many decisions and put our ability to test. Not all times we will have facts to support our decision. For example, Darwin’s insight had no practical payoff, but he was a revered figure because he changed the way humans see their place in nature. Being over inquiring may delay the decision. If we are too careful, we will be so occupied in being careful that we are sure to stumble over what we are going to decide. Our doubts act as deterrents and make us lose the opportunities by delaying our decision. Indecision is debilitating; it feeds upon itself; it is, one might almost say, habit-forming. Not only that, it is contagious. It transmits itself to others who depend on you. There is a big difference between making a decision and implementing it. The measure of success is not whether you have a tough decision to deal with, but whether it’s the same decision you had before. Decide like a man of action; implement like a man of thought. It does not take much strength to decide what to do, but it requires great strength to do things.